Chef Shigeo Akiba is perturbed. 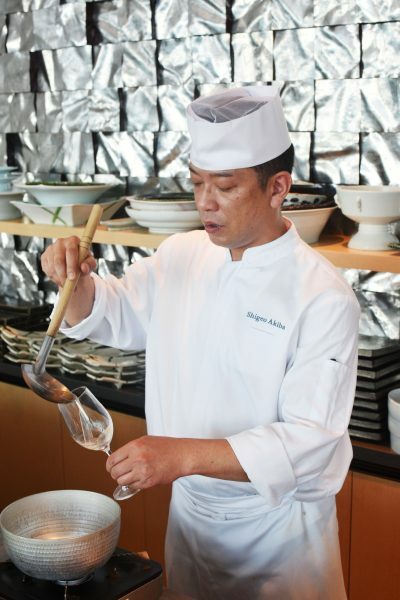 Even after much clarifying done on his interpreter’s part, the head chef of Japanese fine dining restaurant Nami furrows his brows but for only a split second, before plastering on a smile that indicates the unfailing politeness stemmed from his Japanese upbringing. Some things should be left the way they are, he replies to our question about whether if he thought of brewing dashi, umm…more creatively that extends beyond the traditional ingredients of kombu (or kelp) and katsuoboshi (or bonito). We were thinking, perhaps throwing in a fistful of red dates for sweetness? Or maybe some sort of spices to ramp things up a bit? But woe to us for messing with the history of dashi-making, especially one that stretches back to the Jomon Period of 16,000 to 3,000 years ago. In our minds, we imagine Chef Akiba giving us a frosty side-eye when we’re not looking. As repentance, we can only enlighten the unenlightened about this silent and underrated Japanese broth that has moulded the Japanese culture. Let’s begin by indulging you with the first dashi fact, being that the broth is categorised in two forms: Ichiban Dashi (or ‘The First Brew’) that exists as clear soups alone, and the Niban Dashi (or ‘The Second Brew’) that acts as a base for other Japanese delights such as chawanmushi. 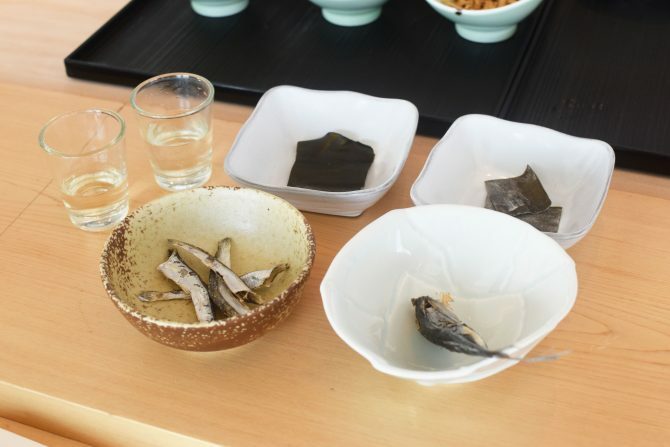 The former is brewed from kombu that has been soaked overnight before it is removed and replaced with a fresh batch of kombu, alongside bonito shavings, to be simmered once more, while the latter is created by boiling the strained ingredients from the first brew with water and other bonito shavings. 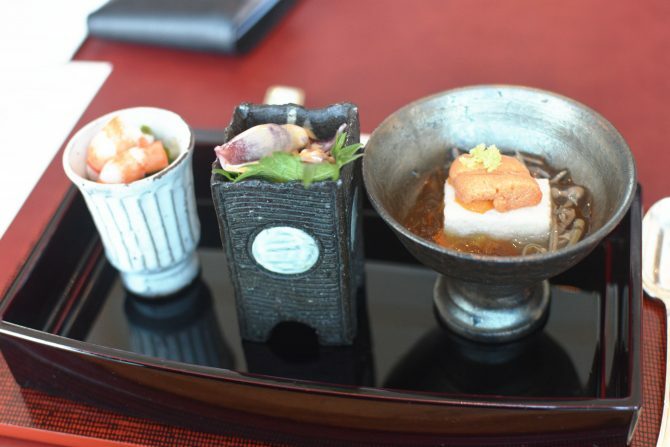 With the foundation set, Nami ladles out varying dashis, including Jako Dashi made from dried baby sardines, Ago Dashi of dried flying fish, and also the vegetarian option Kombu Dashi. But we say learning is at its best when you get hands-on at Nami’s Dashi Appreciation Class ($118) happening every last Saturday morning from 11am to 12pm. The class culminates with a four-course set lunch that centers around the soul-soothing broth. There’s always the other option of sitting through an exquisite seven-course Dashi Menu ($180 per pax), comprising clean and straightforward Japanese dishes that are built on a dashi base. We kick off the dashi deliverance with a trio of petite appetisers: Yam tofu and uni laid on a wobbly dashi jelly, baby squid cooked in dashi and then served with red chilli cream, and shrimp and hosta grass that are also cooked in dashi. Each morsel shows off its natural flavouring distinctly, where the extra frills of sauces and creams come at bonus to elevate the entirety. If dashi were to offer a firm handshake as a formal introduction, it would come with the next course being the Ichiban Dashi-based soup. Here, we taste the dashi almost in its purest form, if not for Chef Akiba who stirs in mirin, sake, light shoyu and shio – a welcome addition to give the broth a piquant oomph. The likes of Hamaguri clam, chicken ball, lettuce, eggplant, shimeiji mushrooms and carrots are then piled into the broth to seal the deal. After slurping up seasonal sashimi (we had tuna and flounder) presented luxuriating dashi sauces, we adjourn to the Odamaki-mushi, featuring a medley of udon noodles, crab meat, and shiitake mushroom nestled comfortably in a custard-y chawanmushi. 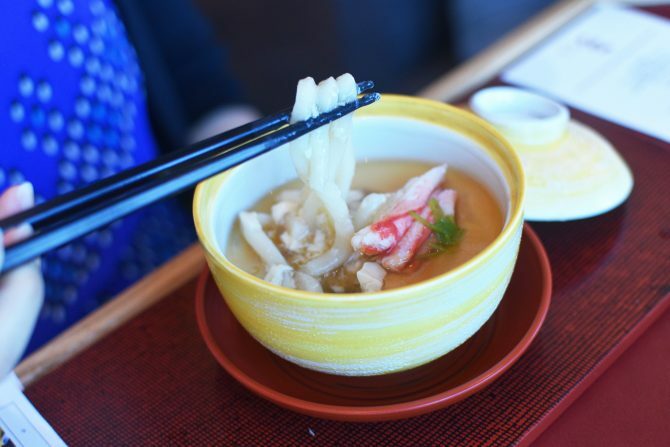 Comprising multiple dashi facets, the unassuming steamed dish requires the meticulous cooking process of udon noodles cooked separately in saba dashi, before placed in the chawanmushi mixture that is then steamed with niban dashi, shoyu, sake and mirin. Mushrooms and crab meat are later added in and then layered with a final niban and saba dashi blend. The result is an umami-packed, velvet-smooth and heartwarming offering that truly spotlights the reverence of dashi. While the Odmaki-mushi is un-toppable, the likes of Miyazaki beef loin and the Hokkaido corn rice do a swell job of getting bellies filled. Still keeping in the dashi theme, the former is shabu-ed in niban dashi mixture and serve with deep-friend eggplants, and the latter has rice steamed in niban dashi. Added into the staple is Hokkaido corn, something we would have preferred a little sweeter. Even our dessert doesn’t go unscathed from the dashi touch. 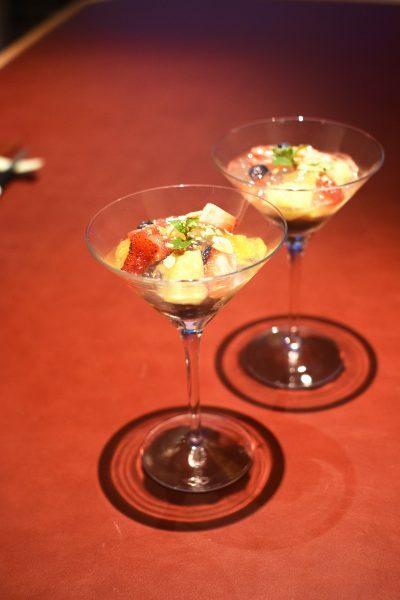 Here, the pretty fruit cocktail is served with plum vinegar and sour plum-infused jellies, both of which are made with dashi. Now, that’s how you give Japan’s integral ingredient of dashi its due respect.